Popular Computing Weekly reported our short-lived venture into business software on 28 November 1985. 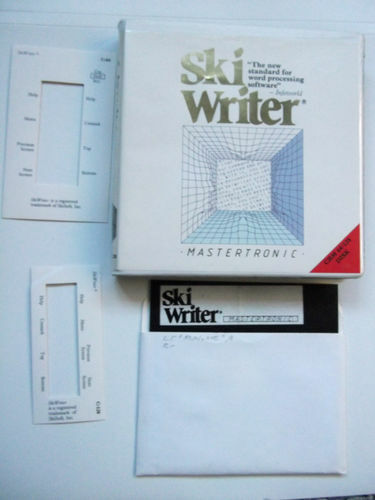 Ski Writer was a word processor written by one Ken Skier and had been released in the USA by Prentice-Hall. 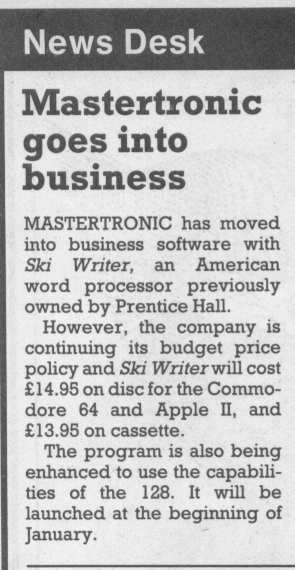 (There are magazine references to a Ski Writer II at this time as well). I tested it before release on the C64 and in so far as that computer was capable of doing worthwhile word processing (not much) the product was ok. I don't think we ever did release it on cassette and the disk sales, not surprisingly, were poor, amounting to about 1000 units. We learned the lesson and avoided business software from then on, apart from releasing Compact Office for the Spectrum in October 1987. I am indebted to Matt Cornes for the scan of Skiwriter, the disk and the keyboard overlay which is reproduced below.